Last Fall, probably in November, there was a knock on my door just around the time I got up from my nap. It was my good neighbor Eric, with a little envelope of heirloom tomato seeds he had painstakingly saved for me. As usual, he declined an invitation to come in, saying he needed to catch a bus to get to work as a cook at a sorority on the Washington State University campus. Eric wasn’t one to stick around, but he was always one to surprise with a gift of the garden, often borne of his years of expertise working with seeds. We didn’t often get together, because my need to plan and his need to wait until the very last minute when his depression might provide him with an opening didn’t add up well to regular visits. But we found each other often enough on our neighborhood sidewalks to develop a friendship over our mutual love of plants and food. Neither one of us owned or used a car, but our opportunities to meet on the sidewalk made our friendship possible. Him: “A caution: The Mushrooms pictured are indeed Meadow’s edge or Forest Edge Agaricus Campestris mushrooms. Their cousins are the button mushrooms in the grocery store from Europe (Agaricus Brittanicus). This particular fungus may give some folks an upset stomach or slight reaction. Always use caution when gathering wild fungus. It’s advisable to at first tag along with an experienced mushroom hunter. 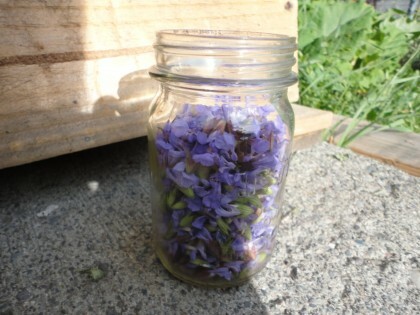 A good addition to the beans is Summer Savory. Remember, always watch for GMO’s in your ingredients for healthier living. Increasing evidence shows they alter the flora and fauna in your lower digestive tract to harm your health. Eric did more than that to make that unique post and meal possible. He introduced me to lovage, saved me some seeds from his big grandmother of a plant, and taught me how to make the sage flower vinegar that is so delicious with this meal. 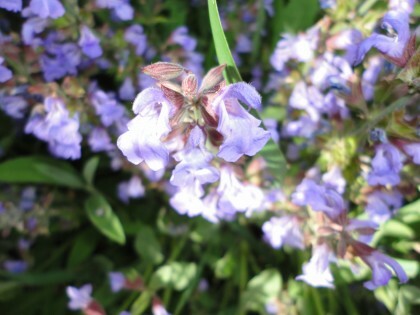 I was sad to discover last year that his landlord’s wife had these beautiful plants obliterated in a pique of ire at Eric for not weeding and pruning them to her satisfaction. I’m hoping that the lovage root ball I rescued and planted with Eric’s permission and the baby one that came up from the seeds he gave me made it through our cold winter to carry on that fine culinary tradition in our old neighborhood. 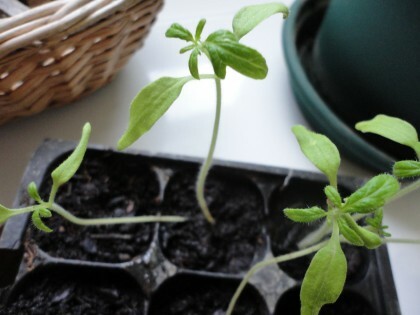 About a month ago, I e-mailed Eric to tell him these little tomato babies were actually coming up, sure and happy signs of Spring. Sometimes he takes a while to answer, so I waited, and then wondered. Wrote again. Now I’m extra extra sad to have to tell you of the passing, not only of some of the plants he tended, but of this wonderful neighbor himself, who once called me a “kindred spirit” in my love of nature. There might have been more times our paths would cross in our neighborhood, if more time had been in the stars. But I am grateful for the time and the knowledge Eric passed on to me, and for the twinkle in his blue eyes that was always there, no matter how hard things were for him. For his simple way of life and his unique style of generosity. His corny sense of humor which included calling himself “Eric Weird.” I will miss him very much. 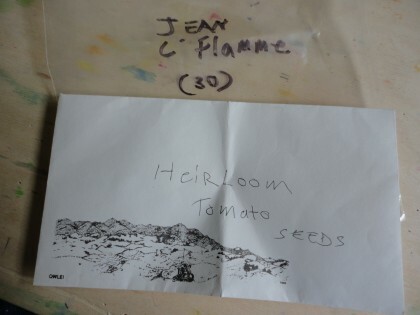 I hope, as tomato season comes on, I’ll be able to finally finish a post on tomatoes I never quite managed, in which Eric’s generosity also played a lovely–and funny– part. So maybe we will celebrate tomato season is his honor when the time comes. My dear readers, cherish your good neighbors and friends. Each one is unique and irreplaceable, and we are blessed to find each other for the time we are given, however long or short it may be. 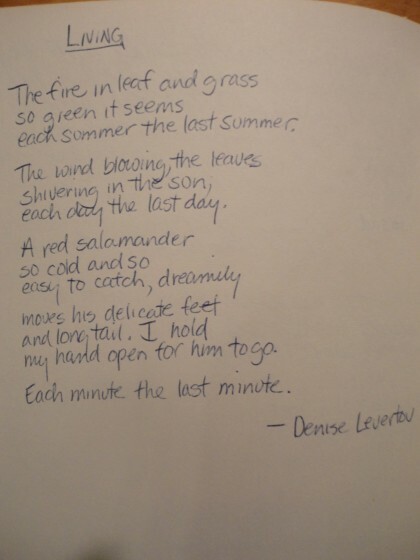 I’d like to close with a poem by Denise Levertov I’ve loved nearly all my life, and which I copied into a special journal for poems I liked a long time ago. My handwriting looks like I might have been 19 or 20. It’s as beautiful a poem to me now as it was then, and I think Eric would have liked it, too. I am sorry to hear of your loss. How lucky you were to have had such a wonderful friend in your life, and even luckier are you to have those seeds and plants. They are even more special and his memory will live on. Thank you, Meissa, Laurel, and Jeanne, for your kind sympathy and understanding. 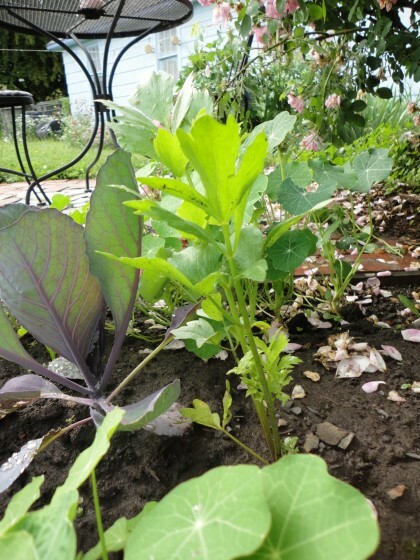 Laurel, it brought tears to my eyes to think of you planting lovage in your garden this year in honor of Eric. That is very moving to me. Maybe someday we’ll both have grandmother-sized lovage plants in our yard to honor him! Beautiful post, Maria. I will be planting lovage in my garden this year in honor of Eric. My condolences, Maria, for your loss of a friend. It’s nice you remember him for the things he loved, and his memory will carry on in the things he shared with you. 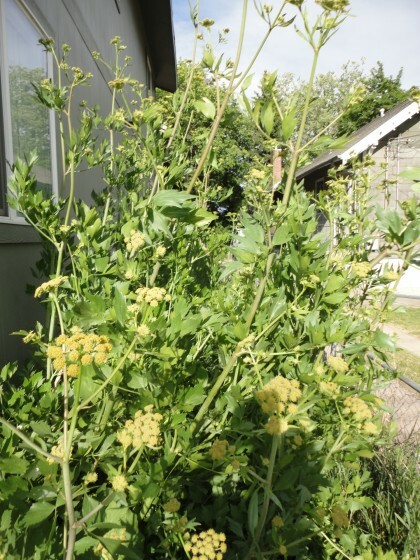 And I’m going to go look up lovage, and see what I can do with it. Thank you very much, Veronica. Yes, each moment IS precious. And I have no doubt you will find something fun to do with lovage, you are such a talented cook! Maria, Thank you for writing such a lovely post, and for sharing this poem with us. I’d never seen it before, and it has arrived at a very opportune time for me. Thank you again. You’re welcome, Angie. Thank you for letting me know that you read the post and that the poem in it came at an opportune time for you. It’s really nice to read that. What a great poem, I read it out loud a few times and savored the realization that each moment is precious, each person we interact with and every experience is special. Maybe that is the secret to happiness, being in the moment and appreciating whatever it is that we are experiencing. Thanks for a great post. So sorry for the loss of a precious friend. Hi Michele, so glad you loved the poem too. Thank you, too, for your lovely articulation of what the secret of happiness might be, and for your kind words on the loss of my friend. So sorry for your loss of a very good neighbor!! You bless us all with your posts and I love these pictures too! Thank you, Carollynne–really appreciate your kind words and your faithful readership. I’m sorry to hear about your special friend neighbor. I too feel we should always take the time to share with others and to let them know we care in a world that is so into themselves. Welcome, Peggy, and thank you for your very kind words. I am so sorry about the loss of your friend. What a beautiful tribute to him. I am inspired by reading your blog to make betterr choices in my life. Hi Karen, thanks for these very kind words and for letting me know that reading my blog has inspired you so. 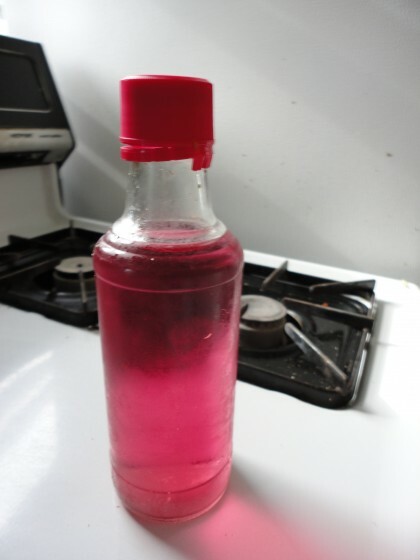 The sage vinegar only involves a day or two in teh fridge–the flowers are fragile–so just until the vinegar turns bright pink.